Taking the time to appreciate the little things which make each day special is one of life's greatest pleasures. A handwritten note sent by snail mail to a friend is sure to brighten up their day. Writing with pen and ink is more personal than text printed out on a screen. One person who understands this is Lindsey, founder of Neatography: a paper goods subscription service which sends out surprise mailings each month or quarter to paper-lovers all over the world. 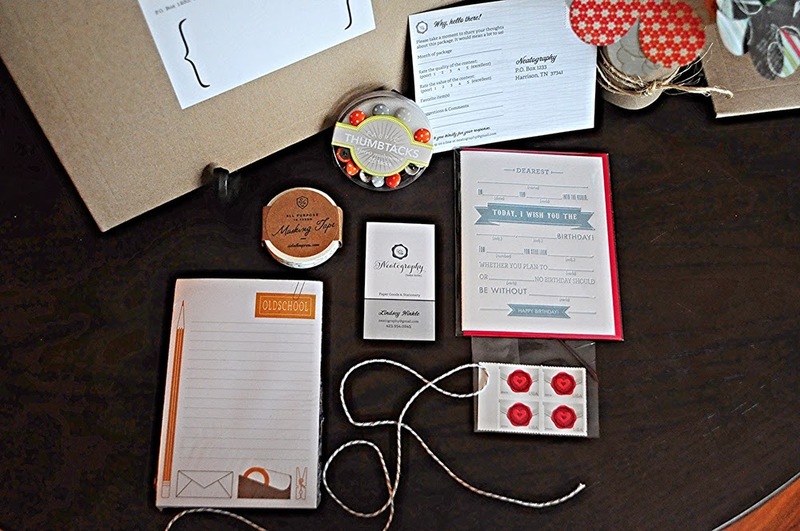 As you may recall, I featured Neatography in my recent post about subscription services for stationery lovers, and was thrilled when Lindsey offered to send Neatography's February package for me to review. After a bumpy ride and a long stay at my neighbour's house (! ), my package finally arrived with me this weekend. For those of you who - like me - enjoy the pleasure of letterpress cards, washi tape and beautiful stickers to adorn your outgoing mail, here is a complete review of February's stationery goodness from Neatography. Slipped within a sturdy cardboard envelope was a beautifully wrapped package which was so well-presented I felt a little guilty untying the strings. I outright squeed when I noticed those adorable bobbins of washi tape - here in England washi tape is difficult to track down (unless you want to spend an arm and a leg paying shipping costs to have your washi imported!). I've had to hide them away for now, though I've no doubt Princess will find them once she reads this post later on! Without question, my favourite items are the spools of washi (which I'll be using to decorate my Filofax Malden later today) and the adorable Par Avion stickers, some of which will be finding their way to my penpals a little later on this week. As yet, I haven't made plans for the other items, but they're all so useful and pretty that I'm sure they'll be used before the month is out! I also found a neat postcard (complete with US postage attached) for me to send my thoughts on the package back to Lindsey which will help her to tailor future packages based on feedback from recipients which I think is a lovely finishing touch. Neatography offers two types of subscriptions, both of which can be delivered on a monthly or quarterly basis. "You can look forward to receiving a monthly selection of desk calendars, note cards, postage stamps, note pads and list pads, labels, tags, writing utensils, journals, post cards, recipe cards, place cards, sticky notes, etc. with a cumulative retail value equal to or greater than $27.00." 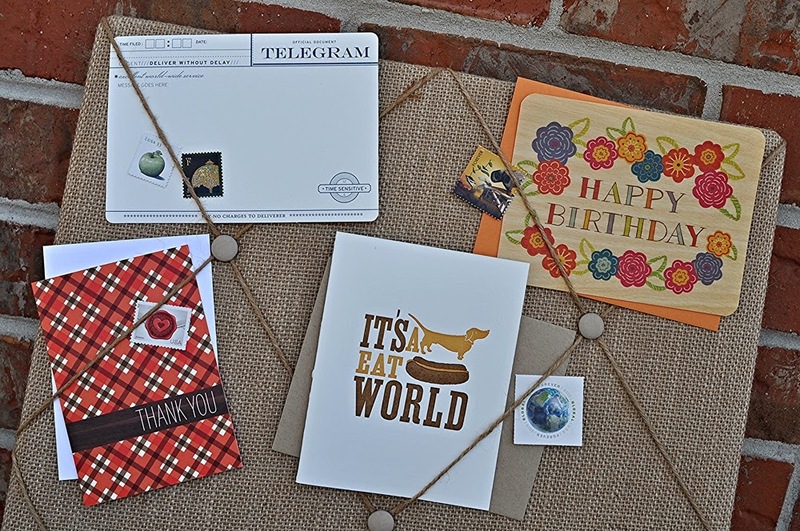 If greetings by mail are your speciality, then the Cards & Stamps Package may be right down your alley. The contents of each mailing will include 3-4 cards and postage stamps. All goods are quite practical, unique in nature or design and of the utmost quality with a cumulative retail value equal to or greater than $17.00. Neatography is based in Chattanooga, and shipping within the United States is included in the cost for each package. International delivery is available for those who live abroad at additional cost, so I'd recommend sending an email before placing an order if you live outside the U.S. I live in the UK and guess that my package arrived after ten days (or it would have if I'd been in when the postman arrived... but that's a whole different story!). That's really not long for a package to be delivered from the States and the extra postage seems more than reasonable. So if you live in Europe or elsewhere and are considering a subscription to Neatography, my advice is to go right ahead - you certainly won't be disappointed! I love to receive surprise packages in the mail, and was delighted with the contents of my February package from Neatography. As an international subscriber, the total monthly cost is a little more though for me this will be offset by the knowledge that I'll receive paper goods I probably wouldn't be able to source for myself. And of course there's the pleasure in receiving a package of stationery goods which I may not otherwise have even known existed. If you love paper goods, be sure to give Neatography a try. Receiving a surprise package in the mail is only the start of the fun! Disclaimer: I received a complimentary package from Neatography for the purpose of this review. But as always, the opinions expressed in my review are my own. I only recommend products and services which I personally use and enjoy. In the case of Neatography, I give the service a huge thumbs up!